What happens at Regal Maids? 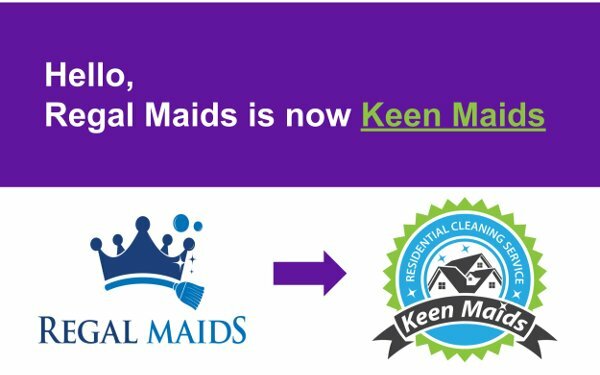 We are excited to announce that after ten years we are changing our company name from Regal Maids to Keen Maids. This name describes what we have learned about ourselves over the last ten years. During this time, we have discovered that what set us apart from others is our willingness to do what it takes in order to make our customers feel satisfied beyond a clean house. We are a team that is keen about listening to our customers, keen on improving our customer experience every day, and keen on fighting grime and dirt! Our new name is a reflection of what motivates us to work every day. There has been no change in management or staff. We are the same people! You will see the same faces in your house and Adda will still be taking care of everything you need. Please check it out by visiting our website at www.keenmaids.com. Or find us on Facebook at https://www.facebook.com/keenmaids. Second, we have gathered all your feedback and suggestions to create new services that have been requested often, so soon good news will come, we will keep you posted! Where does Keen Maids operate? Thank you for being one of our valued customers. We hope to continue serving you with the same affection and quality for many more years. Next PostNext Why Hire Keen Maids?